The glorious combo of salty fried bird and maple-drenched waffle wasn’t invented in L.A. 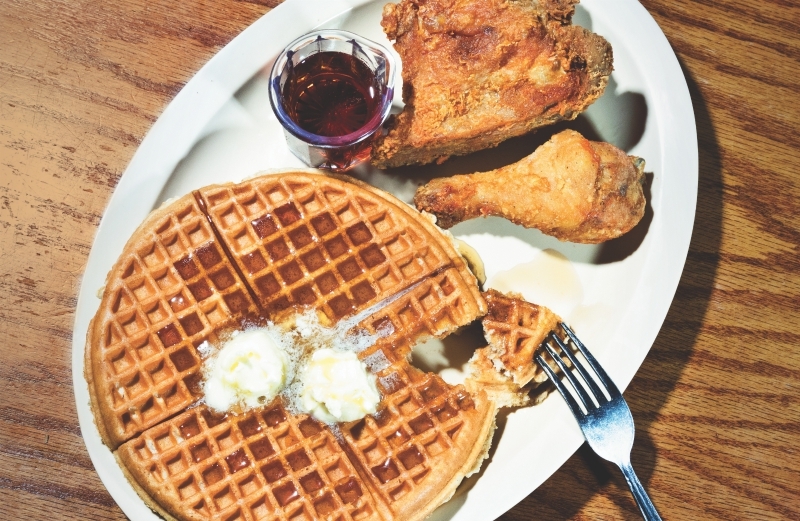 But whether for brunch or a late-night feast, the Southern-style staple still has deep civic ties, thanks to the popularity of local legends like Roscoe’s House of Chicken ’n Waffles and the Googie-fied Pann’s in Westchester. There are elevated riffs at Marcel Vigneron’s Wolf, which tops its rendition of chicken and waffles with maple whip, and at downtown gem Poppy + Rose, which tacks on smoked-honey butter. You’ll have a choice of waffle—from bacon-cheddar to spiced pecan—at Sweet Chick, rapper Nas’s down-home spot on Fairfax. It gets funkier at Baldoria, where chicken-and-waffle tacos double as finger food. And because this is L.A., global takes abound. At Rosaliné, Ricardo Zarate goes Peruvian with sweet-potato beignets and fig chancaca sauce; Louis Tikaram does crackling chicken and “Hong Kong” waffles with sweet chili syrup at E.P. There’s even a vegan version of chicken and waffles at Crossroads. The fowl might be faux, but the maple hot sauce is the real deal.